The Duke Energy Center for the Performing Arts is located in Downtown Raleigh, North Carolina. Nestled between Salisbury Street and Wilmington Street, the Duke Energy Center is just five blocks south of the State Capitol. We want you to have a night to remember. We make parking easy so you can keep your focus where it should be–on live entertainment. From I-40 take exit 298-B. Go 1.5 miles north on S. Saunders St. Turn right onto South St. Go 2 blocks. Duke Energy Center is on the right. Take US-1 South into Raleigh. US-1 becomes Capital Blvd. Stay on Capital Blvd., crossing over I-440 (the Beltline). After you cross I-440 go another 3.4 miles south. Capital Blvd. becomes Dawson St. Go 10 blocks south on Dawson St. (0.8 miles). Turn left onto South St. Go 3 blocks on South St. Duke Energy Center is on the right. From Glenwood Avenue / US-70, follow the US-70 E. signs toward downtown Raleigh. US-70 travels along Glenwood Avenue, turns onto Wade Avenue, then exits onto Capital Blvd. heading south. Capital Blvd. becomes Dawson St. Go 10 blocks south on Dawson St. (0.8 miles). Turn left onto South St. Go 3 blocks on South St. Duke Energy Center is on the right. Take US-64 W. toward Raleigh. US-64 becomes New Bern Ave. Follow New Bern Ave., crossing over I-440. After you cross I-440 go another 2.5 miles west. New Bern Ave. then becomes Edenton St. Go 1 mile on Edenton St. and turn left at the State Capitol onto Salisbury St. Duke Energy Center is 7 blocks on the left. 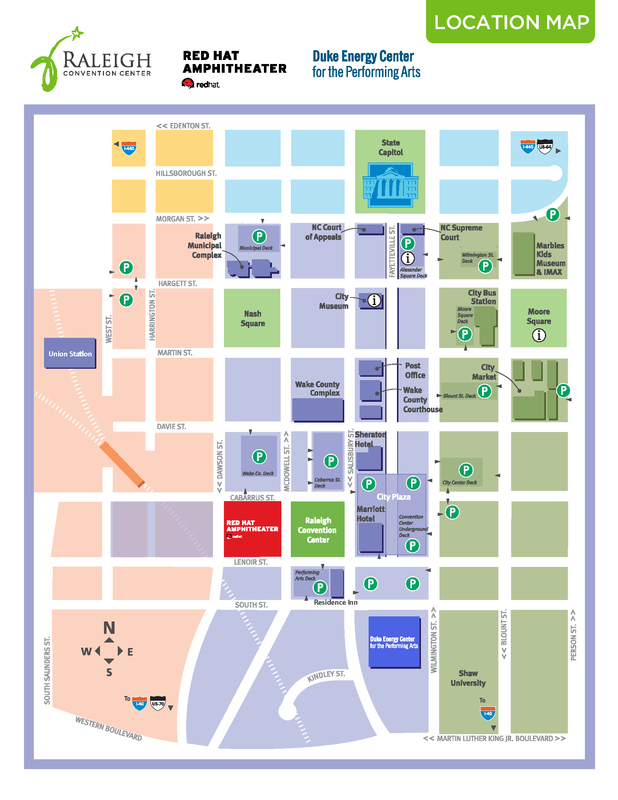 We offer multiple lots, all conveniently located near the Duke Energy Center for the Performing Arts, for $7.00 per car. Look for the "Event Parking" signs and the attendants with the blue aprons. Parking is available in both of the lots located directly across from South Street. There is also parking available in the deck located on the corner of Salisbury and South Streets. Accessible parking spaces are available on the first level of each garage. For those with mobility issues, a shuttle service is also available to transport visitors by golf cart. The carts typically park near the accessible parking spaces both outside and inside the parking deck. Patrons will be transported to Lichtin Plaza in front of the entrances of the Duke Energy Center. A drop-off area is located in the brick area in front of Lichtin Plaza. Driving on the Plaza is strictly prohibited.